Sisters and brothers in Christ, today we gather around the baptismal font, remembering both God’s gracious promises to us and our sisters and brothers in Iraq, Syria and Lebanon (and Egypt). We are united by a common faith in Jesus Christ and a family bond that reaches from east to west, and north to south around this globe; one that covers all time. This was the start of a prayer of solidarity for our brothers and sisters in the Middle East. Mission co-workers with our denomination, the PCUSA – and friends of mine – came to our pulpit to share stories of their first year living in Beirut and working with the National Evangelical Synod of Syria and Lebanon. Powerful stories. I have shared a few on this blog myself, that I have experienced personally. I recognized the places, the faces and the loss and grief as Scott and Elmarie spoke. And since we are God’s children, we are God’s heirs. In fact, together with Christ we are heirs of God’s glory. But if we are to share Christ’s glory, we must also share his suffering. On this day we shared by praying together in solidarity with them. And to remind ourselves to keep praying, we each came forward to the baptismal font and took a polished stone to hold in our hands. Mine is green glass. Polished. Smooth. Easy to hold and to admire. And when it is cupped in my hands, clasped in a gesture of prayer, it is a tactile reminder of those who are heirs to God’s glory and even now sharing in his suffering. 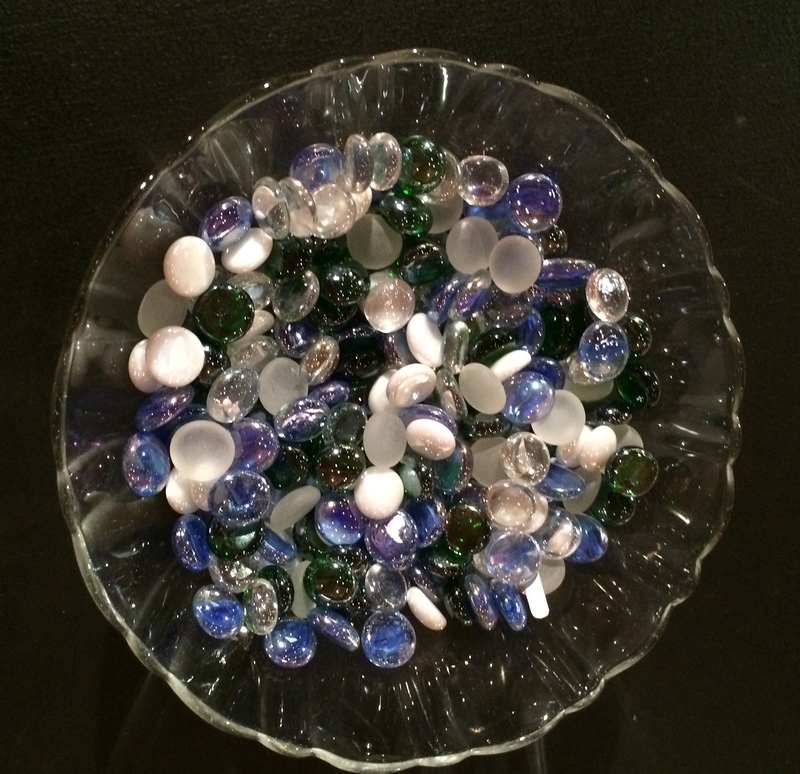 As I look at that picture of the collection of glass stones, I can easily assign names to them; each representing a real person, people I know and love. There’s Lamis from Lattakia who gave me lovely earrings in 2010 in a quieter time and place. There is Toeh, a young woman from Homs, now a refugee with her family in Amr Hasn, who doesn’t even have any photos to remind her of life before the war. There is Huda in Yazdieh, the pastor’s wife who collects food and blankets and distributes with love and prayer to some 1700 families, like Toeh’s. There are the eight pastors still serving fifteen Presbyterian congregations in Syria: Salam, Ibrahim, Yacoub, Ma’an, Michel, Boutrous, Firas and Mofid. There are the synod leaders: Fadi and Josef and Adeeb and George, along with Assis Salim, the head of the organization of evangelical churches. There are the pastors in Lebanon as well, serving their own congregations plus those who have fled there: Mikhael and Rola and Fouad and Hadi. Educators bringing the word of God and the values of Christ to new generations: Najla and Dr. Mary and Nellie and Hala and Izdihar and Riad. Pastors and elders and priests who are doing the same work of provision and reconciliation in Iraq: Haitham and Farook and Magdy, Patriarch Louis Sako, Fr. Aram and Fr. Turkum and Msgr. Emad and Zuhair and all the teachers in the kindergartens. 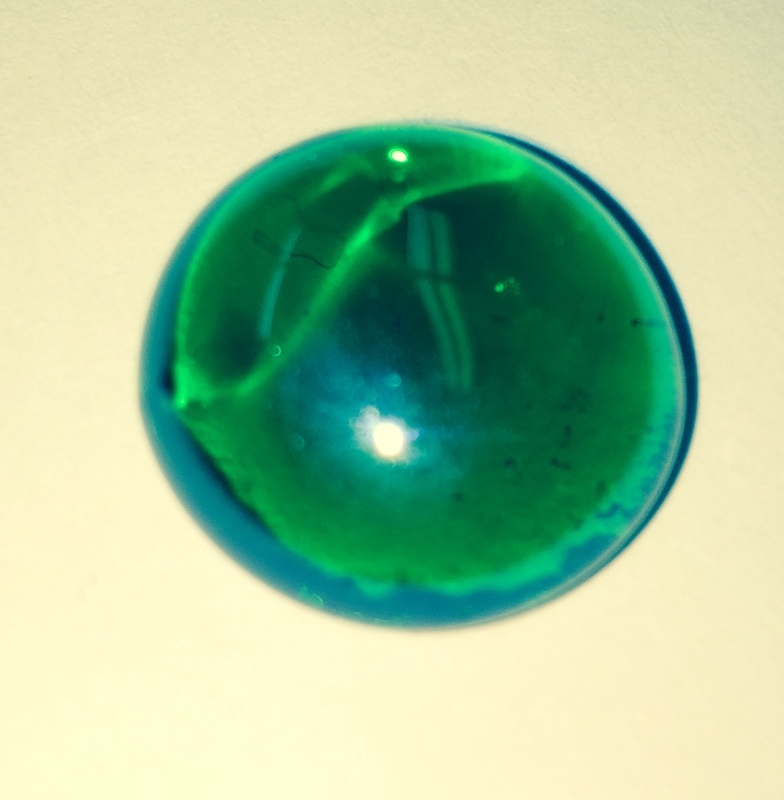 One polished stone for each of them, and I hold this green one in my hands and pray. Saving God, hear this day the cries of those in Syria, Iraq and Lebanon (and Egypt) who have been over-run by violence. For those who are able to flee, guide them to safe havens. For those who stay, whether by choice or lack of means to leave, grant them courage, perseverance, hope and what they need to survive. May your church embody and freely share these gifts with those around them. I always carry a rosary with me, a habit from my Roman Catholic upbringing. It’s a tool for prayer: 59 beads strung together with a crucifix on the end. My Aunt Carolyn, a Franciscan nun, gave this one to me on a trip earlier this year. 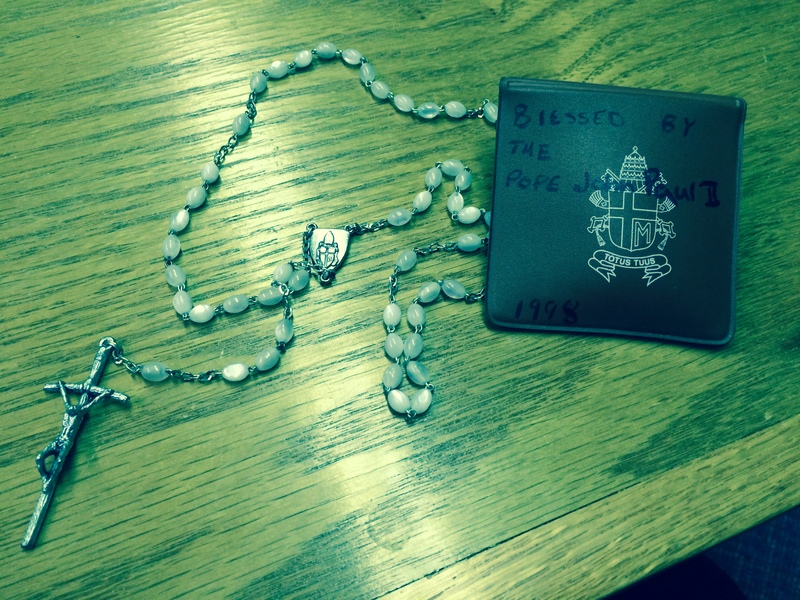 She received it on a trip to Rome in 1998 and it has been blessed by Pope John Paul II. It’s a lovely remembrance of her trip, her vocation, and my connection to her and to the faith I was raised in. I also have a set of beautiful amberwood prayer beads that I purchased in Lebanon this past November from a street vendor named Mohammed. Many of the pastors I know in the Middle East carry these same 33-bead strands with them everywhere, constantly moving the beads through their fingers, not out of habit, but in prayer. It was one of the first things I noticed about Assis Adeeb when I met him in 2010. And this green polished glass stone that is now in front of me while I work, is a visual and tactile connector for me to these strings of beads used in prayer by people like me who follow Jesus. It may be a solitary stone, but it binds me in solidarity with each of those other stones as we pray together. God of peace, empower and guide those who are working to make visible your kingdom ways of justice, peace, and transforming love in Iraq, Syria and Lebanon (and Egypt). Bring your transforming peace to these lands. For Christian schools and teachers working with both Muslim and Christian students we pray – grant them wisdom, creativity, and enduring love. For Muslim and Christian students studying side-by-side – grant them the courage to live into a new kind of future together in the Middle East where there is respect and opportunity for all, regardless of religious creed, ethnicity, or gender. For those working with children orphaned and traumatized by war – grant them daily hope and joy-filled love. For children, women and men maimed in spirit, mind, or body by violence – grant them healing and a new future. For government officials – grant them the will to seek the good of their people and courage to turn away from personal or outside agendas that seek gain from war and instability. For those caught up in violent political and religious radicalism – wake them up to true life. Grant that we, disciples of Jesus from east and west, north and south, bound together by baptism and the Holy Spirit, may live each day with Christ’s kind of self-giving love: doing justice, loving kindness, walking humbly with you. Amen. And, I would add, down the street too please Lord. From our lips to God’s ear… Thank you for such powerful words!